Baking your own dog biscuits is hugely rewarding. Not only does it give you nutritional control over your dog’s treats, but just wait until you see the look on her face! A batch of home-baked biscuits will last for a month or more; you’ll probably find they become your dog’s favourite snack. Here’s our guide to baking your own dog biscuits. Baking biscuits for your dog allows you to control the ingredients. You can choose to use gluten-free flour, olive oil, or homemade stock – depending on what your dog needs. Yeast. Brewer’s yeast – available in tablet and powdered form – is a natural flea repellent! Stock. It’s a good way to make use of the carcass from a Sunday roast: Milk is another alternative. Young dogs will benefit from the extra calcium, though not the fat, so choose semi-skimmed or skimmed milk. Powdered milk is added to some recipes, and this is a cheap store-cupboard ingredient that will come in useful. Fat. Instead of saturated fat (butter), choose olive or sunflower oil, in small amounts, which will give your pet a glossy coat. Flavourings. Along with good meaty stock, you could also add herbs to your pet biscuits. Fennel and rosemary are said to repel fleas. Ingredients to avoid... You may see some recipes with cheese, peanut butter and garlic included in them. Because some dogs can have problems with these ingredients, we’d recommend omitting these from your biscuits. Don’t forget... If you are feeding your pet biscuits in reward, then remember to reduce their daily food slightly. 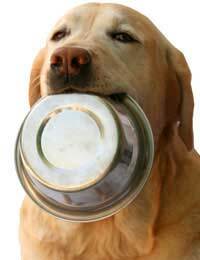 A good idea is to measure your dog’s meals and take out a little for each biscuit that (s)he eats in-between. Here’s a recipe for a tried-and-tested dog biscuit that has proven popular with our spaniel Holly and her visiting guests! These dog biscuits are intended as a treat or reward – she loves them made with beef stock or homemade chicken stock. They will stay crunchy and fresh for 6 weeks. When they come out of the oven, smelling beefy and home-baked, you’ll be tempted to try one! And of course you can... there’s nothing unnatural in these biscuits. A chicken or lamb carcass (if not making the stock, you can substitute this with a low-sodium beef stock cube). 2 cups strong white flour. 1 cup rye flour or wholegrain brown flour (and you can sub ½ the cup for oats if liked). First prepare the stock. Simmer the carcass, just covered with water, in a saucepan for 20 minutes. Remove the carcass (saving any scraps of meat for your pet!) and return the liquid to the pan, then reduce until you have about ½ cup. Continue with the recipe. In a large bowl, blend the flours, yeast and salt. Put the stock into a cup and make the level up to 1 cup with milk. Make a well in the middle and pour in the liquid and olive oil. Beat the egg in the empty cup and add that to the liquid. Now incorporate the liquid slowly into the flour and keep stirring, then use your hands to make a soft dough. Turn onto a floured worktop and knead for at least 10 minutes. Leave the dough to rest, covered, for 2 hours. Now knock back the dough and roll it to 1/2cm thick. Cut bones or shapes and bake in a preheated oven (160 degrees C) for 20-30 minutes, until golden and crisp. Cool and store in an airtight tin or jar.